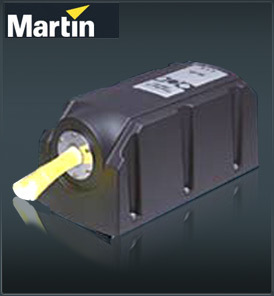 The Martin FiberSource CMY150 is an automated 150-watt color-changing luminaire for illuminating fiber optic cables in permanent installations. It features seamless CMY color mixing and full-range continuous dimming. The new Martin FiberSource CMY150 is a professional fiber illuminator for permanent outdoor and indoor installations. Full CMY color mixing and unprecedented brightness combine to create new design possibilities for fiber applications. Intended for permanent installations, the Martin FiberSource CMY150 is designed around a robust IP44 rated housing. It is based on a very efficient 150 W lamp giving 6000 hours of lamp life. The Martin FiberSource CMY150 features an extremely broad color spectrum achievable from a full CMY color mixing system. Additionally, a full range dimmer gives the user an added effect dimension. The large fiber port accepts up to 800 pieces of 1mm fiber optic cable. The fixture features DMX control and a very comprehensive stand-alone operation including real-time clock activation.